Fla. 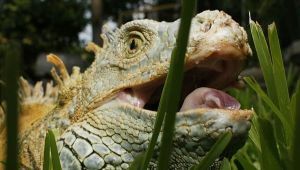 Cold Snap Causes Iguanas to Fall From Trees: "NAPLES, Fla. — The chilly weather in southern Florida this week was cold enough to force some iguanas to fall from trees. Experts say the cold-blooded reptiles go into a deep sleep when the temperature falls into the 40s. Their bodies basically shut off and they lose their grip on the tree. According to Collier County Domestic Animal Services control supervisor Dana Alger, iguana reports traditionally rise when temperatures drop, as the reptiles seek to warm themselves on asphalt surfaces such as sidewalks, roads and driveways. Most of the iguanas were once pets that got released when they got too big. The reptiles can grow up to six feet long."